Please join us for a complimentary webinar reviewing the results of Protiviti’s just-completed 2012 Sarbanes-Oxley Compliance Survey. Remarkably, it has been nearly 10 years since passage of the U.S. Sarbanes-Oxley Act, which introduced sweeping changes to financial reporting processes among public companies worldwide. Ironically, 2012 has brought one of the most significant changes to this landmark legislation with the passage of the Jumpstart our Business Startups (JOBS) Act, which exempts so-called "emerging growth companies" from having to comply with the auditor attestation requirements of Sarbanes-Oxley Section 404(b). 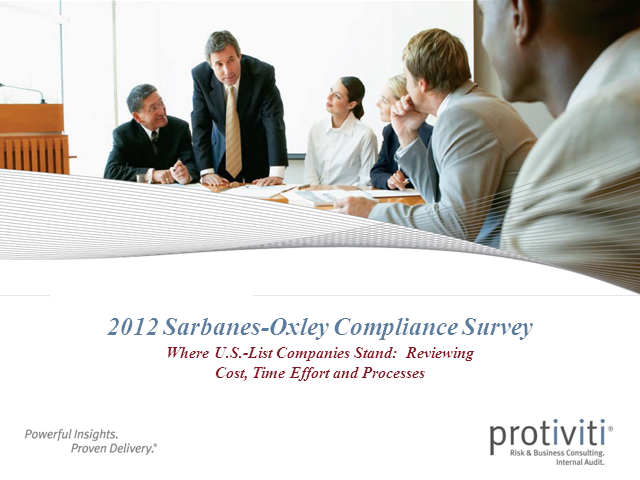 Protiviti’s third annual Sarbanes-Oxley Compliance Survey provides valuable and important insights into how companies are complying with the internal control-related provisions of the Sarbanes-Oxley Act. During this webinar, we’ll report on the current state of Sarbanes-Oxley compliance for all types of organizations, costs and resources, achieving a stronger internal control environment and improved efficiency and effectiveness in operations.